Music, singing and dancing are an integral part of our day at Living School. We use these artistic elements to make our pedagogy come alive with the spirit of cooperation and joy. Upon joining our school, you will have the opportunity to discover and enjoy our team’s various talents who share their passion for the arts with the children! You will discover Mauve’s talents, who initiates the children to a style called Dalcroze and international polyphonic music. 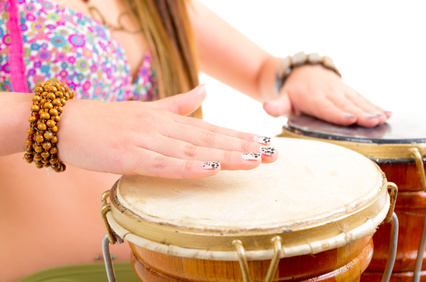 During lessons, the children practice rhythm, note-reading and improvisation in a fun and an innovative way with different musical instruments as well as props such as juggling balls and ribbons. You will meet our English teacher, Julie, trained in dance, who excels in creating choreographies to contemporary and pop music. The children enjoy becoming singers and dancers in their own right, all while practicing their English! If you go by Class 2’s doorway, you will hear Benjamin, our French teacher, violinist and marvelous singer. He guides the children to sing as a chorus, with the help of such a gentle and melodious instrument. Swing by Class 1, where you will meet Andrea, Spanish teacher and Flamenco dancer, who embarks the children on journeys around the world to joyous and rhythmic songs. Olé! Many of our teachers have been initiated to the Dalcroze educational musical method, which links music and movement together while developing artistic skills. Globally, our teachers aim to provide rich musical experiences connected with joy and meaning for the children’s utmost happiness.